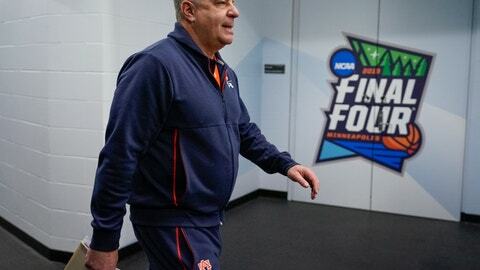 MINNEAPOLIS (AP) — Auburn, Virginia, Michigan State and Texas Tech have arrived in Minneapolis for the Final Four. Teams will practice on Thursday and hold open-to-the-public workouts on Friday. The national semifinals are on Saturday, when Auburn faces Virginia and Michigan State takes on Texas Tech. The championship game is on Monday. The last time Minneapolis hosted the Final Four was in 2001, when Duke beat Arizona for the title at the Metrodome. That stadium was torn down in 2014 to make room for U.S. Bank Stadium, the $1.1 billion building that opened in 2016. Michigan State was in the Final Four in 2001, too, one of 10 times the Spartans have made it. Virginia is making its third appearance. Auburn and Texas Tech are first-timers.